Who are the New Gods? 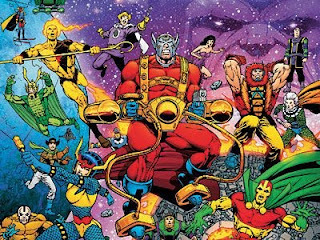 The New Gods are a ragtag team of cosmic deities based on an otherworldly planet called New Genesis. And even though their roster is somewhat ambiguous; they comprise of the following characters: Orion (the angry one). Lightray (the happy one). Forenger (the humanist). High Father (the sage). Big Barda (the warrior woman). Mr Miracle (the trickster). Takion (the earthbound god). Plus many more I care not to mention. Now to oppose these otherworldly deities -- the ying to their yang -- is Orion’s Father, and ruler of the dark world Apocalypse, Darkseid. Basically, Darkseid is a b*stard, and rules his land with an iron fist as well as with the help of his lowly minions. Who are these minions? Dessad (Darkseids duplicitous aide). Kalibak (Orion’s brother, and brute). The Female Furies (leather bound vixens who were trained by...). Granny Goodness (mistress from hell). Kanto (the assassin). Steppenwolf (the hunter). Parademons (the sanguine sentries). Plus also many-many more I care not to mention as well. Meanwhile, acting as a wanton spectator to these proceedings, is Metron, a knowledgeable and cold chap, who rides around in his Mobus Chair on a quest for the secret of life and the anti-life equation. Why do the New Gods Keep on Getting Cancelled? Now you would have thought that characters created by the legendary comic book artist, Jack (Hulk / Thor / War) Kirby, would do really well, right? But no. Wrong. 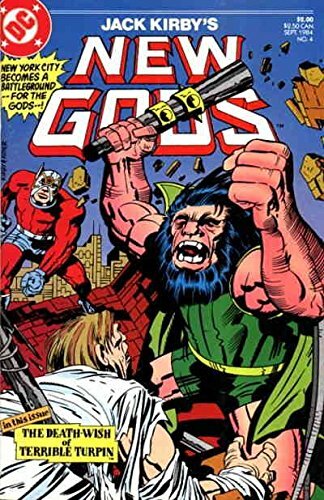 During their not so illustrious comic book career, the New Gods just keep on being cancelled again and again and again; from their initial outing with Jack in the seventies, right up to the present day. Why is this? Well, I have a number of solutions: (1) When Jack and a number of other Marvel employees left ‘the esteemed opposition’ in the early to mid seventies, DC quickly snapped them up, and allowed them to do whatever they wished (within reason of course). Jack wanted to do his Thor pastiche. And the rest is now history. However, that is were one of the problems lie -- history. In essence, the New Gods are Marvel heroes based in the DC universe. And although they are good heroes by in large, this misplacement doesn't quite work within this opposed domain. (2) History is another factor that doesn't seem to sit too with the New Gods either, as their origins are expanding, and their roots are steeped in mythic lore. Now some people may like this (me), while other people don't (mostly everyone else), thus making them an acquired taste that is not everybody's cup of tea. (3) Most New God related comic books are known for being cancelled time after time after time (six series in total at last count), and this reputation seems to have stayed with them, thus repelling new readers to jump on board. (4) For quite a long time the whole pretext of the New Gods – as well as the battle between New Genesis and Apocalypse – was all to do with Darkseids quest for the Anti-life equation. In my opinion this pretext dragged on for quite some time (thirty odd years in fact), inadvertently making the characters seem too shallow, and their formula too tried and tested. (5) The New God’s are actual Gods, and so they are based on archetypes which can appear very two dimensional on the page. Orion is angry -- Mr Miracle is the trickster -- and never the twain shall meet – if you get my drift? Furthermore, whenever something new happens to these characters, it doesn't really feel right because their characters have been established as these archetypes. So it’s a case of “Damned if you do, and damned it you don’t”. And regretfully, damned is where they always seem to be. What of the New God’s future? Thankfully, even if they haven't managed to sustain a regular title, they have managed to keep on keepin on in the DC Universe. 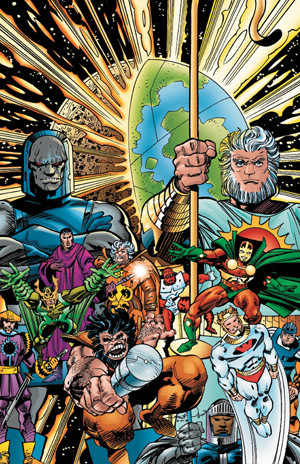 At present, all the New Gods are dead in the current DC universe (due to ‘The Death of the New Gods’ mini-series), yet they are still able to make it into cartoons (Superman / Batman: Apocalypse) as well as inhabit one of the 52 multiversal planets (something that has not been fully explored presently). Moreover, with this latter development still in the pipeline (i.e. the new 52), I am sure that we'll be seeing the New God again... one day (Justice League perhaps? ).